Using MMC/SD card driver and FAT16 library for CCS C compiler we can read files from FAT16 formatted SD card using SPI protocol. 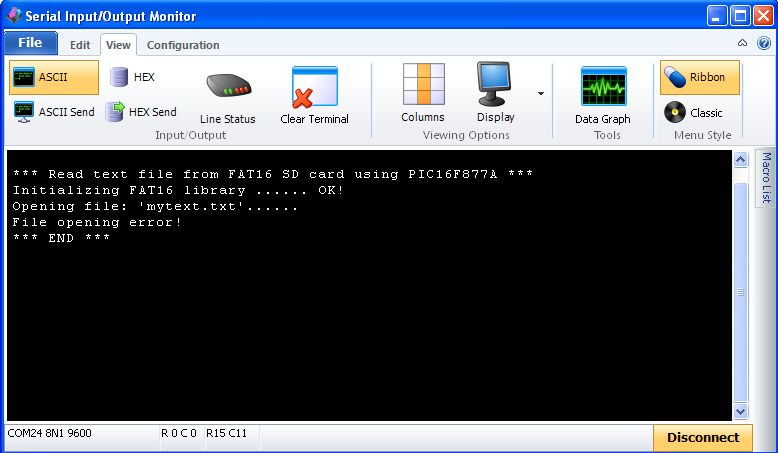 This topic shows how to read and display a text file from SD card using PIC16F877A microcontroller and CCS PIC C compiler. UART protocol will be used to display the content of the text file. Simply the text file which I’m going to display is the source code of this project. The AMS1117 3.3V voltage regulator is used to supply the SD card with 3.3V. Also 3 voltage dividers are used to step down the 5V which comes from the microcontroller to about 3V which is sufficient for the SD card. Each voltage divider consists of 2K2 and 3K3 resistors. MAX232 integrated circuit is used to interface the microcontroller with the PC, I connected just one wire (RD2) because I need to transmit data from the SD card to the microcontroller and then from the microcontroller to the PC, there is no need to connect the second wire because I don’t have to send data from the PC to the microcontroller. and there is an other pin which is CS (Chip Select) can be connected to any digital output pin (defined in the code), this pin is connected to SS pin of the SD card. The code used for this example is shown below. It was tested with CCS PIC C compiler versions 5.051 and 5.070. The text file which I used is just the code below, I named it in Windows “mytext” (basically it is mytext.txt) but in the CCS C code we’ve to add the extension of the file which becomes “mytext.txt”. I used a read buffer of 10 bytes ( file_data ), so the microcontroller reads the text file 10 bytes by 10 bytes, it reads 10 bytes and send it to the PC via RS232 then the second 10 bytes and so on until the function fat16_read_data(10, file_data) returns 1 which means we’re at the end of the file. I used the command printf(“%s”, file_data) to display file data as string. 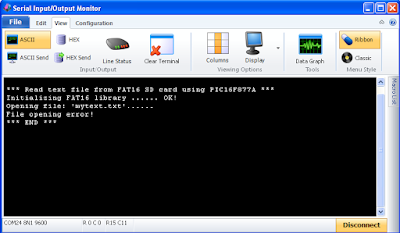 // Read text file from SD card with FAT16 file system CCS C code. // Fat16 library and MMC/SD card driver for CCS C compiler must be installed! // Use at your own risk!